Three artists to celebrate this month, and every month after. Devyn Springer, Sunshowers (2017). Courtesy the artist. To honor the moments of Pride Month and Ramadhan, which coincide this June, we set out to cast a spotlight on an intersection of identities that often goes overlooked—something along the lines of '10 Queer Muslim Artists To Pay Attention To.' But after striking conversations with three artists who openly identify as queer and Muslim, opting for the good-ol' listicle—gambit of peak Buzzfeed and staple of the clickbait internet—started to seem like the wrong direction to pursue. An article enumerating artists that share intersectional identities is roughly the 21st century's equivalent of yellow journalism, only one step shy of penny press headlines that blare 'THESE 10 ARTISTS ARE QUEER AND MUSLIM!' In the case of marginalized identities, it is the act of proffering visibility itself that often subjects human experiences to the whims of clickbait logic, or what French theorist Guy Debord would call a spectacle—a narrative packaged down to a single idea for easy consumption. The question, then, is how to promote visibility without implicating subjects in the reductive gaze of novelty. Harder still, how do we champion marginalized subjects without limiting them to the circumstances of their marginalization? Representation is crucial, but the over-simplification that often comes with these attempts can be just as (if not more) harmful than not being represented at all. In contemporary media, the line between meaningful visibility and the co-opting of identities into clickbait spectacles is deceptively thin. Samra Habib, an artist working on an ongoing series titled "Just Me and Allah," documents the lives and experiences of queer Muslims through photography and narrative interviews—a project that proffers meaningful visibility and provides a platform for discussion all on its own. "The body of work," Habib told me in an email, "aims to bring to light the struggles and often complicated experiences of queer Muslims by documenting visual history and narratives. Historically, photography has been forbidden in Islam so there's very little photo archival evidence of the existence of queer Muslims." Samra Habib, El Farouk (2016). Courtesy the artist. Habib's form of visibility-giving, or representing, takes the form of a recorded archive. Rather than portraying the queer Muslim experience as a closed narrative with fixed characteristics, she highlights its diversity, creating a historical network of individual presence that is fluid and difficult to reduce to a monolithic entity—in the way that journalism’s tools of a soundbite, a stereotype, and a clickbait headline are often wont to do. Habib’s take on visibility and more holistic presentations of identity also resonate with some of Atlanta-based photographer and activist Devyn Springer's experiments. Inspired by the likes of artist Adrian Piper, Springer grapples with what it means to represent the marginal experience, both of his own and that of others. With photographs that range from documenting protests to intimate and avant-garde self-portraits, Springer crystallizes complicated and multitudinous moments in ways that uphold and frame his subjects’ complexities. Springer told me that his multi-media art blurs the lines between poetry and photography, adding that “I don't think there should be a line between the two at all." Devyn Springer, C2 (2016). Courtesy the artist. "It is often quite difficult living unapologetically as Black, queer, and Muslim, all identities that are thought to be in conflict," Springer said. 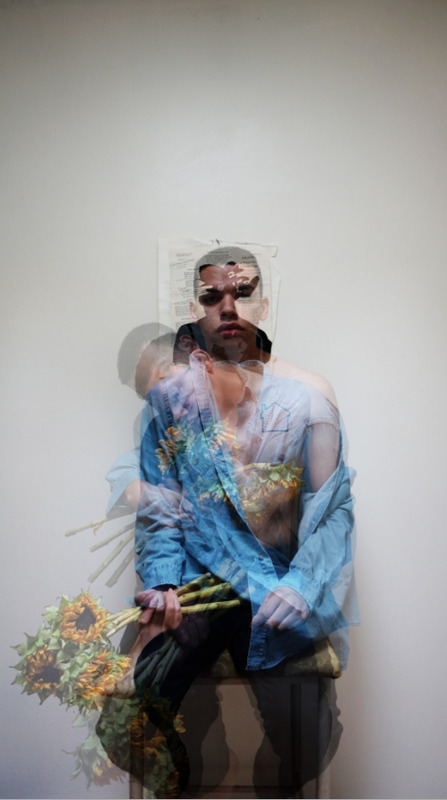 “[My art] feels like a symbolic recreation of this conflict in identities." 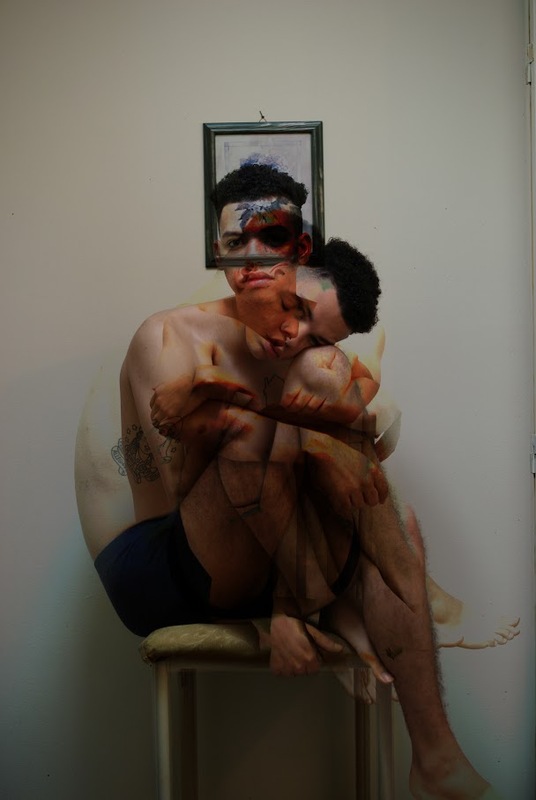 His self-portraits, also mixed-media photographs, find him in two, three, or four places at once in the same frame, multiplying (or fracturing) his body in a blur of postures and expressions that barely yields an impression of one. Saba Taj, The Cleaving (2016). Courtesy the artist. From Taj’s “queering” of bodies to Springer’s self-representation in multitudes and Habib’s purposeful emphasis on the multiplicity of experience, visibility in each of their practices is thoroughly fluid (queer). The artists’ systems of representation defy the singularizing force of spectacle that comes with most platforms of visibility; rather than reducing them to a consumable idea, their queered representations point to a more complicated narrative. Perhaps it is time for journalism, too, to be queered, so that it can provide a richer and more complicated platform that Taj, Springer, and Habib’s multidimensional works succeed in achieving. From the outside peering in, the journalistic gaze can only narrate what it cannot understand. Maybe once the framework is queered can storytelling fully embrace its subjects.